When customer concerns require escalation and legal support, brands need assurance that these will be handled effectively, professionally and discretely. To supplement our Contact Center programs, our Executive Office and Legal Support solutions are dedicated to owning and managing escalated customer cases to satisfactory resolution. Percepta designed a comprehensive Executive Office (EO) solution for our UK Automotive Client, which aims to deliver stress free support at all levels. Our highly skilled EO Team manage customer concerns which have been escalated to our Client’s senior management team. Their primary role is legal; to ensure that the concern is managed with minimum disruption to both customer and Client. If concerns are escalated to court, then we ensure our EO legal experts are on hand to work through the legal process on behalf of the Client. Percepta’s team is highly trained to handle concerns over Trading Standards, County Court claims, insurance inquiries, personal injury, Data Protection requests, safety concerns and more. Over the course of our relationship with the UK Client, we have successfully represented all legal approaches through the Courts, due to our unique mix of multi-skilled customer advisors and legal experts. A key driver of this success is the in-depth training received by each EO team member. Employees are trained for eight weeks prior to any customer contact, and legal advisors are buddied with their mentor for a year before representing any Clients, so by the time they are handling customer concerns they have the right skills and expertise to provide the very best in service and support. 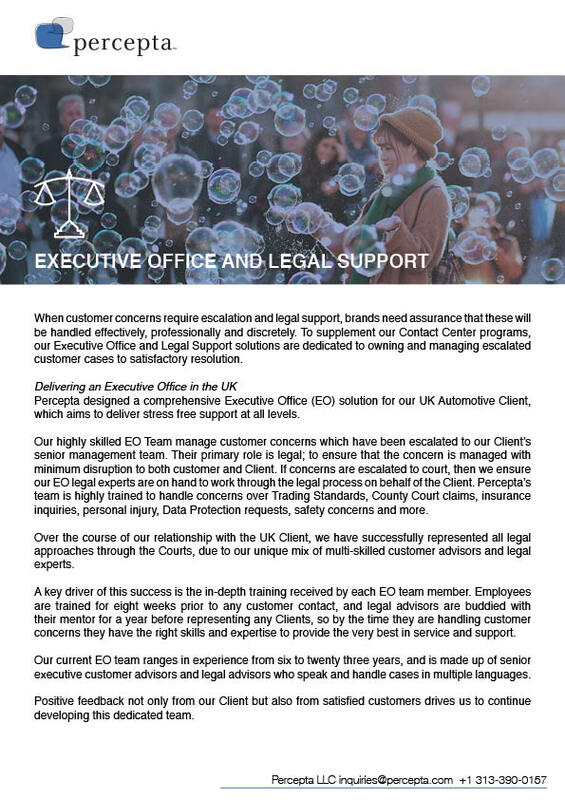 Our current EO team ranges in experience from six to twenty three years, and is made up of senior executive customer advisors and legal advisors who speak and handle cases in multiple languages. Positive feedback not only from our Client but also from satisfied customers drives us to continue developing this dedicated team.